We are glad that you have decided to include London in your holiday this year or maybe in the close future. This is why we have written this article with a few tips and tricks when it comes to means of transport and British accommodations. Thus, your planning will be less stressful and more fun, concentrating mainly on the touristic objectives. Regarding your flight options, if you are looking for a cheap plane ticket then Luton is the right choice for you. This is the place to find the best low cost airline companies. Although it is located outside Central London, there are several options for airport transfers. You will find some of the best at the end of this article. You simply have to choose the most suitable one for you, taking into consideration your budget and other facilities. Next comes another important part of a holiday: the perfect hotel. We would recommend you to choose Comfort Inn Vauxhall for several reasons. First of all, the prices are accessible for each type of traveller, even if you are by yourself, surrounded by friends or with your family. Among the close-by attractions are the following: Tate Britain, Westminster Abbey, London Eye, Houses of Parliament and many more. Comfort Inn Vauxhall is situated in the River Thames area, so that you can take advantage of a romantic walk at any hour of the day. Moreover, you have Victoria and Waterloo Stations nearby, meaning that you can reach any other district in London. This way, you can check any touristic objective on your list. Not to mention all the great facilities that await in your hotel room. In order to get a Luton to Comfort Inn Vauxhall Transfer by rail, you could take the bus from Luton Airport Bus Station (every 10 minutes) and then the train from Luton (every 30 minutes) via King’s Cross St. Pancras (every 5 minutes). This journey might take about 49 minutes. A second option would be to take the bus from Luton Airport Bus Station (line 757 – every 30 minutes) via Marble Arch (line 2 – every 10 minutes). This whole journey will last about 1 hour and 30 minutes. 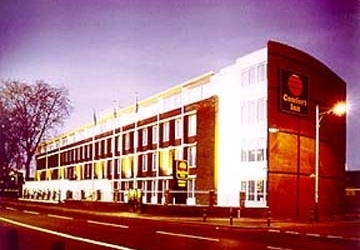 A Luton to Comfort Inn Vauxhall Transfer by car can be done by taking the M1 motorway. Luton Airport is at a 34.7 miles distance from Comfort Inn Vauxhall. This journey will take about 53 minutes, without including traffic. A Luton to Comfort Inn Vauxhall Transfer with 247 Airport Transfer is going to take about 1 hour and 17 minutes, including rush hour traffic. The price for a Luton to Comfort Inn Vauxhall Transfer starts from 56 GBP.